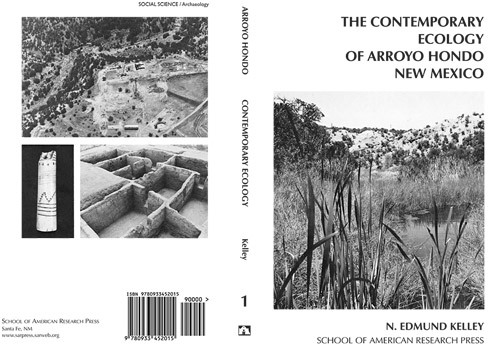 The Contemporary Ecology of Arroyo Hondo, New Mexico, N. Edmund Kelley,1983, School of American Research Press, Santa Fe, New Mexico. Arroyo Hondo Archeological Series, Volume 1. 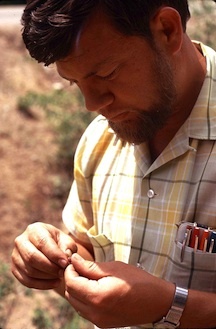 The Arroyo Hondo Pueblo contemporary ecology project investigated the Pueblo’s contemporary environment in order to lay a foundation for a better understanding of life and economic activities at this great prehistoric settlement. In this monograph, project ecologist N. Edmund Kelley reported on the contemporary ecology of the area immediately surrounding Arroyo Hondo Pueblo and for comparison the larger region from the Sangre de Cristo Mountains to the Rio Grande. Presented in detail are considerations of Arroyo Hondo’s topography, geology, soil, climate, hydrology, vegetation, and animal life.